A perfect healthy treat for a hot summers' day. You can feel comfortable giving this low calorie treat to your pup knowing it's refreshing and full of nutrient rich fresh salmon! Frozen treats area truly great way to cool down your pup in the heat of summer. These summer treats can be super easy or a bit fancy. With everything from simple frozen fruit pieces, such as strawberries or bananas, to homemade "ice cream', and frozen mixtures. If your dog has weak or chipped teeth be mindful of giving fully frozen treats, some yummy ice cream might be a little easier for them to eat. Just as with the baked treats, Dog Treat Kitchen is by far my favourite online summer treat resource. They offer an array of recipes in fruit, vegetable, meats, and yoghurt. With such titles as Tuna Pops and Frozen Meatballs, we know your pup will love them! They also stock pupsicle molds for purchase, if ice cube trays just won't do. All recipes are free to download and there's even a chatroom for feedback on the recipes. Bark Post brings us great blog articles, contests, and quizzes each and every day. But they also have a wonderful selection of dog ice cream recipes. Yummy... Strawberry Coconut and Peanut Butter Banana are two of Lexy's favourites. 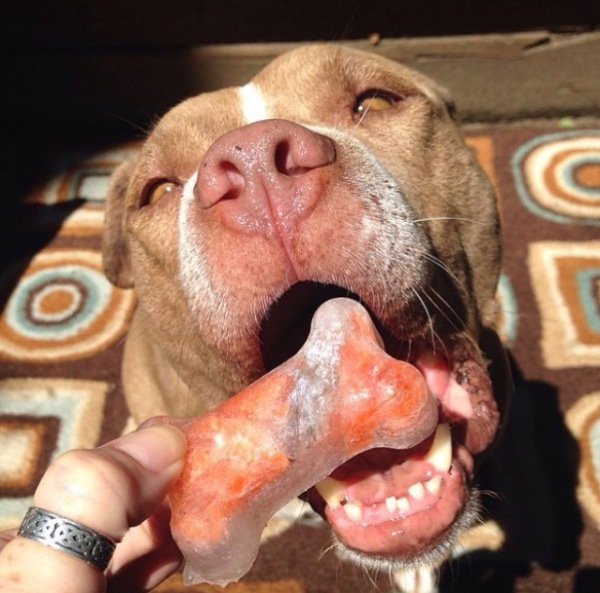 Lexy is in love with Modern Dog Magazine's Frozen Fruity Pops! *REMEMBER: It is always advisable to check with your Veterinarian prior to introducing new foods to your dog's diet.